Two Lady Finger banana plants blew down overnight. 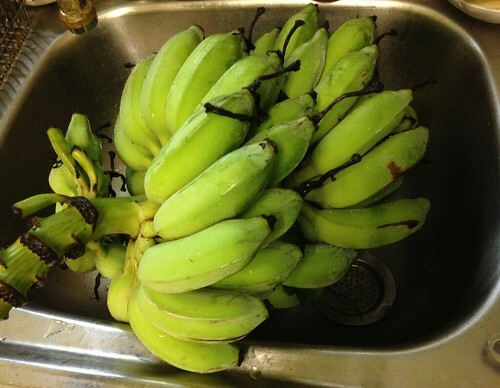 One was bearing a large bunch of bananas that I was watching until ready to harvest. As the bunch was now laying in a pool of water on the ground I had to harvest it while green. I think the bunch is advanced enough to continue to ripen indoors, at least I hope it is. It not I’ll be looking for recipes for green bananas. 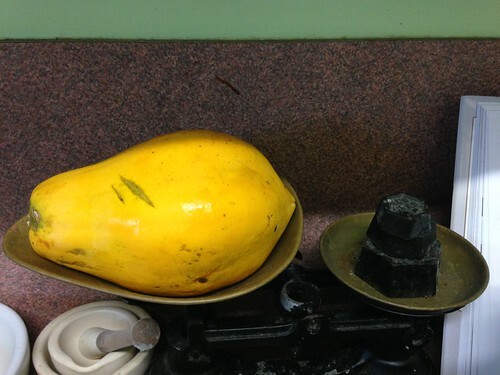 I also picked the large ripe pawpaw (papaya) that I have been watching from the kitchen window. It had turned a lovely shade of yellow so was ripe for the picking. I didn’t want to see this one blown off the tree. 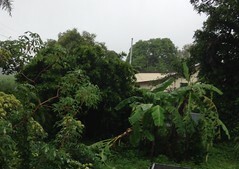 Apart from the strong winds experienced last night, the tropicals in the garden seem to be enjoying the excess of water. I’m wondering if this will bring a bumper citrus crop come the dry season and winter harvest. How exotic to be picking bananas and a papaya (which I love)! The silver lining to the storm clouds. Those bananas look great. They will ripen in a few days. The papaya looks good too.